Intended use: All runs except trail and sprint. Midsole: Compression molded EVA, hard foam insert on the arch side, forefoot+rearfoot DNA gel cushioning units, thermoplastic (TPU) shank. The Ghost 5 irons out the crinkles of the Ghost 4, and is now close to perfect as a neutral running shoe can be. With its unique and adaptive DNA cushioning, the Ghost runs firm on speed runs, and feels plush at a lower pace. So run fast, or go on a relaxed weekend run. 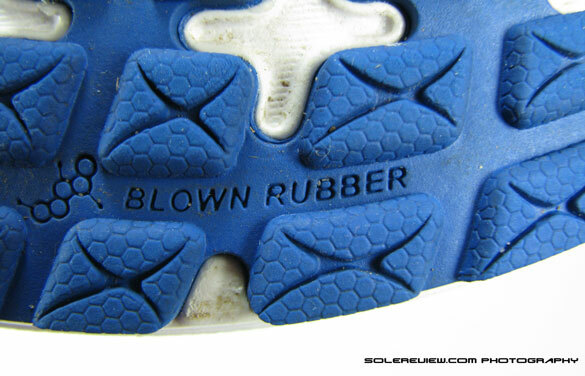 A versatile running tool, if ever there was one. 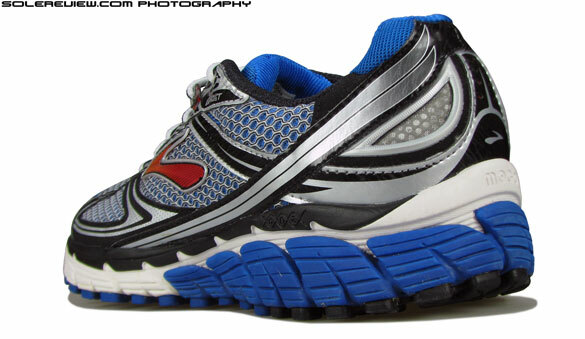 Posting late reviews of Brooks is inadvertently becoming a solereview tradition. We’ve had the Ghost 5 for over a year before finally coming to review it. The natural consequence of which is us putting a lot of miles on the Ghost 5, which is good. On the other hand, a review of the Ghost 5 is irrelevant for runners looking for an opinion of the current season Ghost 6 – which by the way, is close to completing its lifecycle. It’ll soon be replaced by the Ghost 7 in June. But like they say – better late than never, and we’ll dive deep into the Ghost 5 before reviewing the Ghost 6 later this week. We praised the Ghost 4 when we reviewed it, because it was such a solid, all around performer. Adaptive cushioning (more on that below), premium materials, good fit and an impressive ride quality. The model change approach for Brooks till now has been based on making small, yet impactful changes which tends to be evolutionary than a head to toe makeover. This makes sure that Brooks loyalists ease in comfortably into the newer model, while recognising the familiar features and benefits which they found appealing in the outgoing shoe. The Ghost 5 takes the same path to newness, adding in fresh elements which makes the shoe better. Without any preamble, we like to point out two small, yet significant improvements which the Ghost 5 brings about. The first change happens just below the Arch area. 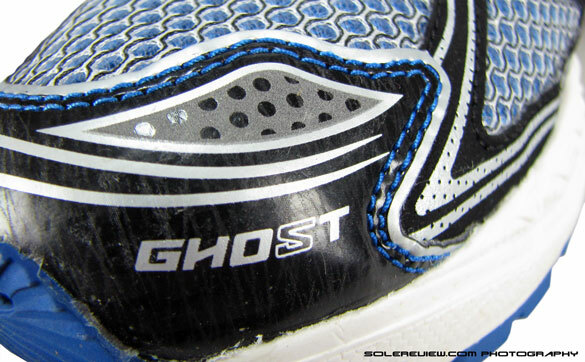 The Ghost 4 had a plastic arch shank wrapping both sides of the midsole. The 2013 Ghost 5 has a plastic stability device, but only on the arch side. 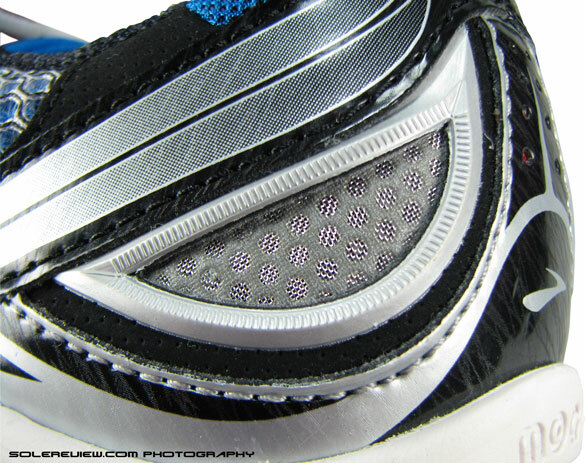 The gap on the outer side is now filled with outsole rubber and a midsole crash pad just below it. 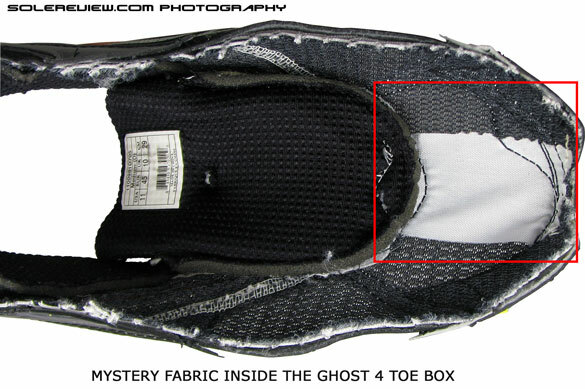 The Ghost 4 also had the crash pad, but only restricted to the heel area. The Ghost 5 extends this crash pad along the outer length of the midsole, supporting the newfound coverage of the rubber outsole below the arch area. The crash pad, visually differentiated by a contrast colour, is firmer than the rest of the midsole foam. So what effect does this change have on the ride vs. the Ghost 4? 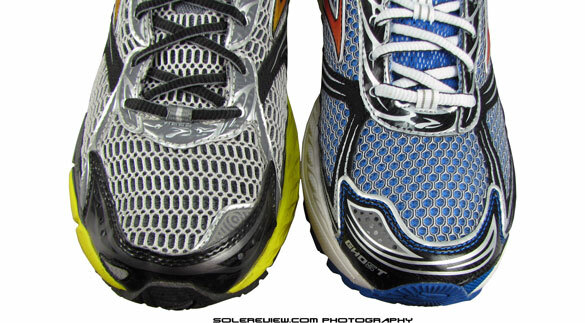 The heel to toe transition comes across as way smoother. Running in the Ghost 5 immediately makes the lack of material beneath the Ghost 4’s arch obvious. 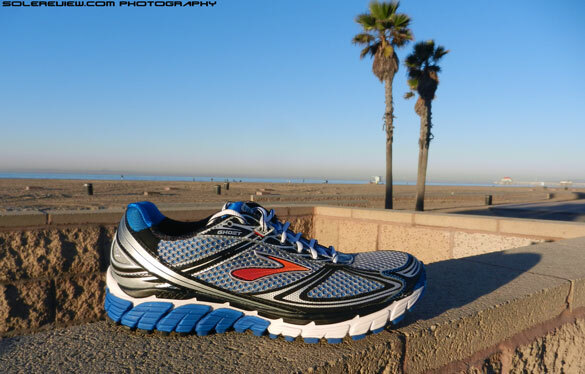 If we had to describe the running transition in the Ghost 4, it would be ‘ heel strike – slight gap – forefoot – toe off’. The Ghost 5 remedies that sensation by filling the below-arch area with foam and rubber. The resultant ride is a feeling of uninterrupted heel-to-toe weight loading. In addition, extension of the firmer crash pad increases compatibility for high arched runners, helping a more effective inward roll of the foot. The second change applies to what Brooks calls the ‘Omega Groove’. 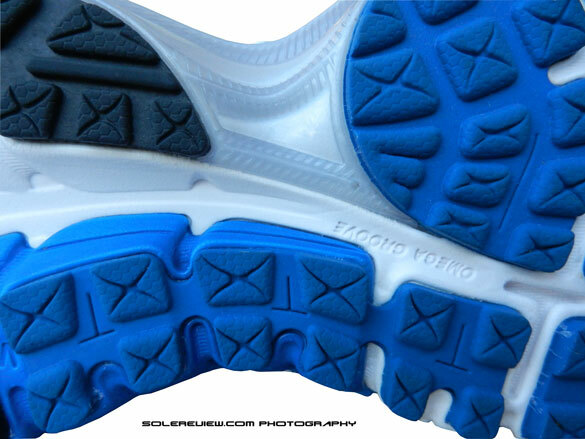 In plain-speak, this is a ridge running through the centre of the outsole surface. Starts at the centre of the heel, and snakes its way forward to one side of the forefoot. What does this do? It helps the progression of the foot movement as it transfers weight from heel to toe. Not that this is a unique feature for Brooks. Other industry vets have it in their shoes in some form or the other. Asics calls it the Guidance line. Nike doesn’t call it anything. You get the idea. The Ghost 5 features a deeper ridge compared to the Ghost 4, and it improves the straight line tracking. 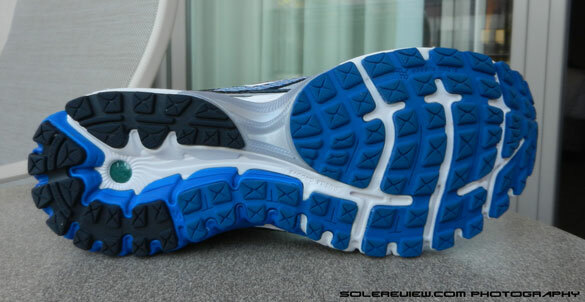 Among other noteworthy mentions, the outsole has a redesigned layout of the rubber pieces. If the Ghost 4 was all about the use of larger ‘waffle’ lugs, the Ghost 5 changes that to an increased number of smaller pieces. The surface area remains more or less unchanged, but the intent of the new design appears to be better grip and weight distribution. Honestly, we could not feel a noticeable difference except under the arch area, but the theory holds water. The Ghost 5 outsole performs well on the durability, grip and feedback. The combination of the hard wearing rubber in the heel and softer, blown forefoot rubber comes together well, providing good levels of traction and cushioning, while allowing the foot to get good ground feedback. The Brooks Ghost 5’s cushioning feels just right, in large part helped by the dual density ‘Mogo’ midsole, the ‘BioMogo’ insole and the use of heel and forefoot DNA gel pads. These gel units sit in the heel and forefoot, and are ’non-Newtonian’ in behaviour. In English, it means that the material is spongy to the touch, but hardens on impact. What good does this do? This reduces the amount of residual force transmitted to the foot, which is a good measure of how effective the cushioning is. And the DNA units aren’t exactly the size of M&M’s either. When we opened up the similarly designed Ghost 4 midsole (image above), we found the heel DNA unit to be a thick, teardrop shaped unit covering 100% of the heel area. The forefoot area has a DNA piece which is thinner yet feels adequate, with flex grooves built in. 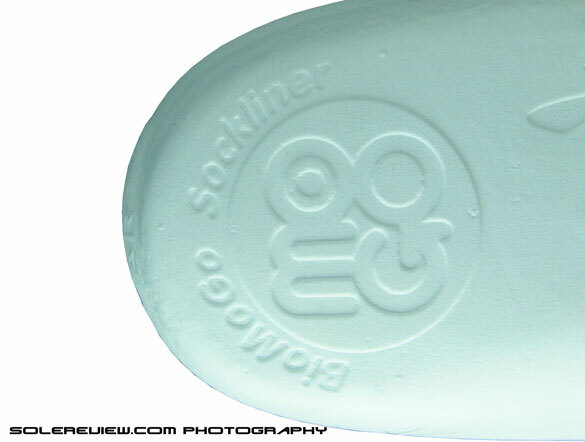 Brooks is the only manufacturer to features these unique gels, and it is with sadness we note that these will disappear in the Ghost 7. The Ghost is an extremely versatile, cushioned running shoe meant for a diverse range of neutral runners, with the ability to adapt to different running paces. 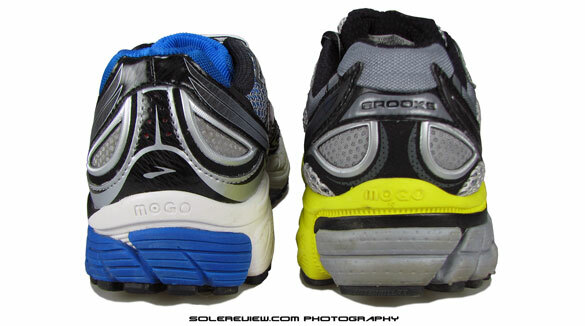 At walking or slow running speeds, the cushioning comes across as soft. Speed up, and the DNA gel hardens with greater impact, giving the runners the firm ride needed to build pace. 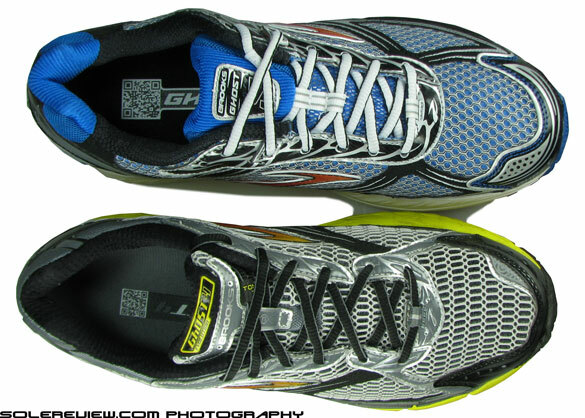 The Ghost and the Glycerin are one of the few neutral shoes with this type of universal use, and that hasn’t changed with the 2014 Ghost 6 and Glycerin 11 either. The outward appearances of the Ghost 4 and 5 upper look deceptively similar, but there are tweaks which squashes most of the small gripes we had with the Ghost 4. 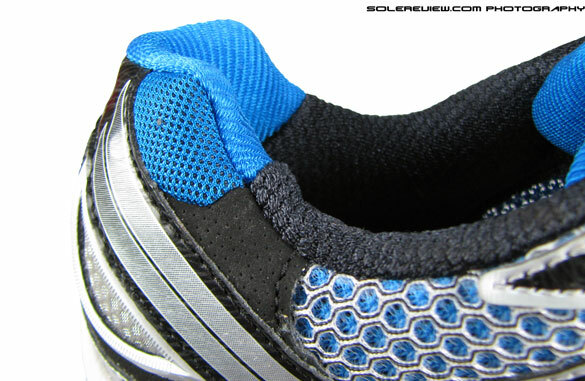 The forefoot design of the Ghost 4 had these poorly placed side toe box overlays – these immovable strips of synthetic leather had the effect of hemming in the forefoot from the sides. 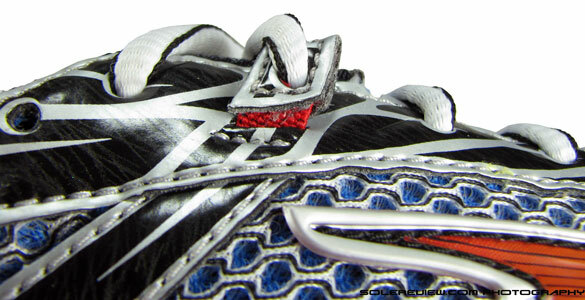 The Ghost 5 changes the material of the toe overlays, and also moves it upwards. Voila! The forefoot fit and feel of the Ghost 5 is vastly improved. There was also this sensation of hotness right under the centre of the Ghost 4 toe box. This was caused by the inexplicable presence of a fabric just below the mesh (image above). We still can’t understand why the fabric was there in the first place, but whatever the rationale, the Ghost 5 did good to remove that offending piece. Fabric lining in the tongue and Achilles area has been softened up, feeling plusher than the Ghost 4. The use of the softer lining in the Achilles cuff makes the collar area come across as better fitting than the Ghost 4, and sure to prevent any skin chaffs. Midfoot lockdown is bettered slightly by the inclusion of the elastic lace loop right at the top – a new feature on the Ghost 5 upper. Other elements carry over from the G4, like the toe and heel reflectivity and the small tongue loop which keeps the tongue from sliding inwards. Even after a year of ownership, we found it hard to see any faults with the Ghost 5. If we had really had to, we’d say that the truant spaghetti like nature of the laces is very annoying, but that’s just about it. The weight is ok too for a shoe which packs in so much. 352 gms/12.4 ounces for a half pair of US 11 is standard for this category, which includes shoes from both Brooks and the competition. If the Ghost fell short of any marks, it was in the version 4. The Ghost 5 is a shoe with almost no flaws and we’d recommend this shoe to any runner who is out to get a pair of neutral shoes. The cushioning adapts itself to a diverse range of running pace, which means the shoe can do anything from a short run to a marathon, and the upper fits and feels great. We’ll give as far to give the shoe an overall rating of 4.5/5; with the average laces holding back half a point. To the Ghost 6, then. Meanwhile, the Ghost 5 is in the extreme close-out zone, making this an amazing deal if you can snag a pair at around $50-60.